Ditch the Old-Fashioned way of ironing! 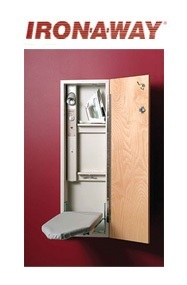 Ironing becomes quicker and more convenient with IRON-A-WAY Built-In Ironing Centers. Today’s demanding lifestyle makes ease and convenience necessary and IRON-A-WAY offers several styles to match perfectly with your individual needs. Open the door, lower the board, and you’re ready. Your iron and supplies are stored inside, too. It’s that easy! IRON-A-WAY has truly turned the “beast” into a built-in convenience! Gary’s Vacuflo, is your source for innovative products that make today’s demanding lifestyles more effortless. Call us today, we will gladly answer your questions and help you pick the IRON-A-WAY center that will fit your needs and budget.